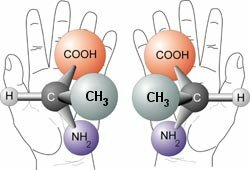 This illustration shows that some molecules form two isomers that are like hands. They are mirror images but are not superimposable. Naturalistic evolutionists face many problems, most of which are the result of the fact that science doesn’t support what they want to believe. As a result, they must make up desperate explanations to work around what science clearly says. Nowhere is this more true than in origin-of-life research. Serious scientists understand that life comes only from other life. That’s what all the data clearly demonstrate. However, a naturalistic evolutionist simply cannot believe that. As a result, he or she must cook up wild scenarios by which nonliving chemicals can react with one another to magically create life. Of course, there are countless problems with such wild scenarios. Demski and Wells recount many of them in their book, The Design of Life. Simon Conway Morris has an even more devastating review of the various origin-of-life scenarios in his book, Life’s Solution. One of the many intractable issues in any naturalistic origin-of-life scenario is chirality. There are many molecules that have the same chemical formula but are quite different chemically. Glucose, for example is the sugar found in green, leafy vegetables. Fructose, on the other hand, is the sugar found in fruit. They are chemically quite different (which is why they taste different), but they have the exact same chemical formula: C6H12O6. They are chemically different because despite the fact that they contain exactly the same complement of atoms, the atoms arrange themselves into differently structured molecules. We call such molecules isomers. There are many kinds of isomers, and one specific kind is a stereoisomer. Consider your hands. They are mirror images of one another. If you hold them together at the palms, your fingers and thumbs all match. However, if you try to lay one of your palms on the back of your other hand, your fingers and thumbs will not match. Your thumbs, for example, will be on opposite sides. In other words, while your hands are reflections of each other, they cannot be superimposed on one another. There are molecules like that as well. They are mirror images of each other, but there is no way you can turn one of the molecules around and make it look exactly like the other molecule. Such molecules are called stereoisomers. Because they are like your hands, we actually refer to one stereoisomer as the “left-handed” isomer and the other as the “right-handed” isomer. An example of such a molecule is shown in the sketch above. The amino acid alanine can be formed two ways. Like your hands, those two molecules are mirror images of each other, but there is no way you can turn one of those images into an exact replica of the other. If a molecule has a stereoisomer, it is called a chiral molecule, and chiral amino acids cause all sorts of headaches for those who want to believe that life sprung from nonliving chemicals. Why the headaches? Well, the “simple” molecules that were supposed to exist on primordial earth are not chiral (we call them achiral). However, naturalistic evolutionists are forced to believe that these simple chemicals reacted and eventually produced the constituent molecules of life. The problem is that all but one of the amino acids in life are chiral. Since amino acids are the constituents of proteins, and since life’s chemistry is based on proteins, naturalistic evolutionists are forced to believe that these chiral amino acids came from chemicals that are achiral. Now here’s the problem. The proteins found in life are made almost exclusively from left-handed amino acids.2 So origin-of-life researchers have to believe that there was, at one time, a great exception to the well-known fact that achiral molecules react to form racemic mixtures of chiral molecules. In order for nonliving chemicals to produce life, there had to be some magic moment in time when the laws of chemistry didn’t work like they do today. Otherwise, there would be equal amounts of left-handed and right-handed amino acids in life’s proteins. Of course, when you actually look at the study, you see that it produces no such evidence. Instead, it adds to the evidence that it is impossible to produce just one stereoisomer from reactions between achiral chemicals. The researchers knew that “simple” amino acids like alanine can be found found on meteorites, and they also knew that there is typically a slight excess of left-handed amino acids in those meteorites. So they thought that perhaps some condition in space could produce more left-handed alanine than right-handed alanine. UV-circularly polarized light (UV-CPL) occurs naturally in space, and they thought that it could induce achiral molecules to react and form something other than a racemic mixture of chiral alanine. To test their idea, they shined UV-CPL onto an ice mixture that contained water, methanol, and ammonia. When they analyzed the results, they found success…well…sort of. Their experiment had produced 1.34% more left-handed alanine than right-handed alanine. To solve the chirality problem in origin-of-life scenarios, then, all you have to do is assume that the reactions that formed amino acids occurred on meteoroids in the presence of UV-CPL, and those meteoroids fell to earth as meteorites to seed the left-handed amino acids that life needed in order to form. Of course, the experimental results don’t lend support to that idea at all! Remember, the proteins of life are almost exclusively composed of left-handed amino acids. A 1.34% excess is rather far from almost exclusively. It gets worse, however. The researchers used conditions that aren’t typically encountered in space. For example, they irradiated their sample for 10 hours at room temperature. Why would they do that when they are trying to simulate what is going on in interstellar space (which is generally at temperatures 20-30 times colder than room temperature)? Because models predicted that such a high temperature would favor forming a non-racemic mixture. So…in order to get a mere 1.34% excess of the left-handed version of one of the “simplest” amino acids in life, the researchers had to do their experiment at completely unrealistic temperatures – temperatures that are thought to heavily favor the result they wanted. This is how desperate naturalistic evolutionists have become. They rig their experiment with unrealistic conditions, and even then, they can produce only a tiny bit more left-handed alanine than right-handed alanine. Nevertheless, that is considered a positive result! I am glad I look at the data and draw my conclusions that way. I just don’t have the kind of faith necessary to call that a positive result! 1. Michael North, Principles and Applications of Stereochemistry, (CRC Press, 1998), p. 230. 2. Dieter Rehder, Chemistry in Space: From Interstellar Matter to the Origin of Life, (Wiley-VCH, 2010), p. 222. 3. Pierre de Marcellu, et al., “Non-Racemic Amino Acid Production by Ultraviolet Irradiation of Achiral Interstellar Ice Analogs With Circularly Polarized Light,” The Astrophysical Journal, 727:L27, 2011. I’m not sure if this plays any significant role in the origin of life research, but wouldn’t any reaction in space be subject to higher end of the spectrum(gamma),in which the rays would have a negative effect on the chemical bonds? Jeff, you are certainly correct on that point. That (in my opinion) is why only certain amino acids are found on meteorites, and why their concentrations are so very low. It continually amazes and amuses me that the evolutionist will tell of the Christian for adhering to something based on non-falsifiability while retreating their own theories further and further away from science that they can test. At least while the theory was restricted to earth they could make a reasonable estimate as to what conditions to expect, but if it gets moved somewhere into space they can choose whatever conditions they want to maximize their slim chances. Josiah, you are exactly right!